Several of the monks at Shasta Abbey attended the University of Washington earlier in their lives. 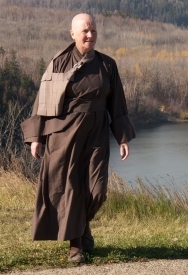 Recently they were interviewed about their journey to, and their lives in, the monastery. The magazine is on line and can be downloaded (be warned, it’s a large file). The article starts on page 25. There are a few photographs included, I like the lead picture of a monk putting on her shoes outside of the ceremony hall. The lighting just catches the mood and feel of early morning. And now in the late evening the crickets chirp away in the night, the traffic on Interstate Five a constant whoosh, whoosh background accompaniment. Uh! there goes a truck. Grerrrrr. And another one. Visitors are sometimes surprised that a monastery would be sited right next to a busy interstate highway. The noise never did bother me when I lived here and it doesn’t now. As somebody once said in my presence, Where ever you are there will be sound! Thank you for the link to the magazine article. I really enjoyed reading the piece. As an inquisitive person (aka nosey! ), I sometimes wonder about the life histories of western Buddhist monks, their initial contacts with Buddhism, the specific attractions to each one of taking up robes, their experiences of leading a monastic life and so on. Obviously, the article provides a brief sketch of some of this for three monks at Shasta. However, as I type, I am beginning to think that the precise biographical details may not be so important after all. That people choose a monastic life and all that it entails, including providing inspiration and guidance to the laity, is, for me at least, the important part. For that I am extremely grateful. Yes, I enjoyed the article too :-) Inspirational and interesting. It was just what I wanted/needed to read. ….and that _anybody_, including you, lay or monastic chooses to sit and _continue_ to sit and live the best life they can is inspiring to me. So thank you Andy for your few comments over the past few weeks. I usually like to respond right away however that just has not been possible of late. Welcome!